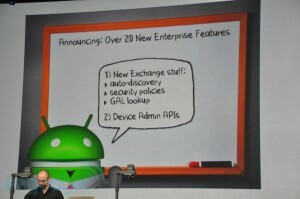 Today during the second keynote at Google I/O 2010 in CA was a big day for Google announcing a new version of Android. Google’s Vice-President of Engineering Vic Gundotra took a lot of shots at Apple’s closed environment, during the keynote. Vic Gundotra stated in the keynote that Android has 100,000+ new activations each day. And the mobile operating system is available in 21 OEM’s, 48 countries & 59 carriers. The Google Android mobile operating system is second in smart phone sales & first in web & app usage in the US. 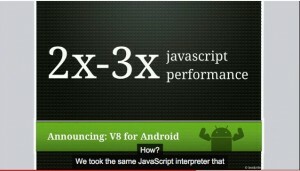 Vic Gundotra also stated in the keynote that the Android Market place has 50,000 applications and 180,000 developers. Android 2.2 was also announced during the keynote. The new firmware update will included a lot of improvements to speed, improved Android Market & it will offer a lot of other new features. 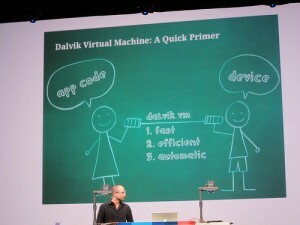 Android 2.2 will have a new compiler called Davlvik VM Just-In-Time, which will allow applications to be able to run 2X to 5X faster, then in pervious versions of Android. 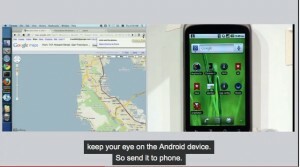 A demo was shown with two Nexus One headsets one running Android 2.2 & the other running Android 2.1. The demo had both the handsets running the same game to show off the frames per second. 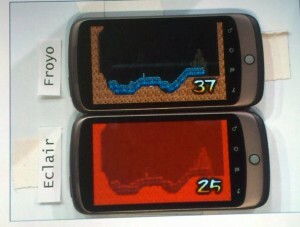 The Nexus One running Android 2.2 (Froyo) never dropped below 30 FPS while the Nexus One running Android 2.1(Eclair) did. Android 2.2 will also improve its Enterprise functionality with auto account-discovery, calander sync for Exchange & improved security. Android 2.2 will allow administrator to wipe the phone remotely, this will allow users to erase all the data on their phone from another location if the phone gets stolen. Android 2.2 will sync with Exchange calendars. Android will no longer have the pattern lock screen found on current Android handsets. Instead it will have numeric pin or alphanumeric for password security. Android 2.2 will have auto discovery which will allow a user to only need to input their user name & password and will be able to sync with their Exchange accounts. Android 2.2 will have “Global Address Lists look-up” which will allow user to auto-complete recipient names from their directory. Android 2.2 has a lot of new features & services in the update one of them being portable Wi-Fi hotspot. With this feature enabled will turn cretin Android handsets like the Nexus One into a portable Wi-Fi hotspot. This will allow up to 8 devices to connect to the Internet using the handset’s 3G connection. Android 2.2 also comes with USB tethering, which will allow users to use their handset’s 3G data connection to browse the Internet. 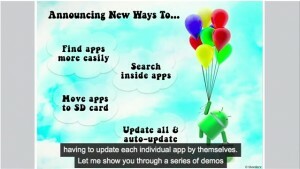 Android 2.2 will also feature called “Could-to-device Messaging”, which was demoed at the conference. 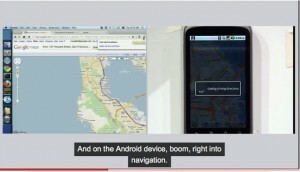 Using the Google Chrome web browser extension, which allows the user to send a Google Maps location to the phone. Once the information has been sent to the phone, Android will automatically open the Google Maps mobile application and show the directions to the location. 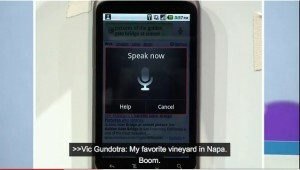 Android 2.2 will have voice search & foreign language translation. With this new feature you will be able to do searches on Google using voice input. In Android 2.2 you will also be able to call shops & company in Google Search using voice input from the Android web browser. Voice foreign language translation is a feature that will allow the user to translate their voice input into different languages. The video below show’s the demo of the foreign language translation feature. Another announcement at Google I/O was improvements to the Android Market. Android 2.2 will also feature an application search bar that will allow users to search applications from the home screen. Android 2.2 will allow for applications to be stored on the microSD card. Android Market will also allow the user to automatically update applications. 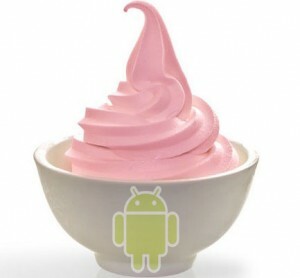 Android 2.2 will also have the ability to send developers reports on their applications if the application crashes. The Android Market place will be accessible from a PC or Mac from a web browser. The Android Market place will allow users to download applications on their PC or Mac and send it over-the-air to their phones. Android 2.2 will also have the ability to sync with iTunes music over-the air & stream it to their Android handset. This means user will not have to hook up their Android handset to their computer to sync their music. The video below shows the demo of streaming iTunes music to your Android handset. Vic Gundotra also showed off mobile ads that will show ads relevant to what is being shown within the handset browser or applications. A demo was shown with the Flixter application. In the application an ad for Vampire Diaries was shown with a drop down menu. When the dropped down menu was tapped a video for the show would start to play. Well, that’s about everything that I was able to cover from the Google I/O 2010 keynote. If you would like to watch the whole keynote please go to Google I/O 2010 YouTube channel. So tell me what do think of the new features of Android 2.2?